How Are These Gifts Possilbe? Experience vibrant praise and worship to help you ignite your love of Christ and experience His beautiful mercy. Intercessory prayer teams available to pray with attendees. Music is led by Fairfax area musicians and intercessory prayer teams will be available. These pictures are from a group that met at St. Charles Borromeo twice per month for praise and worship, speakers, prayer ministry, and also went on summer hiking trips. Fr. Dave Pivonka, Franciscan T.O.R. 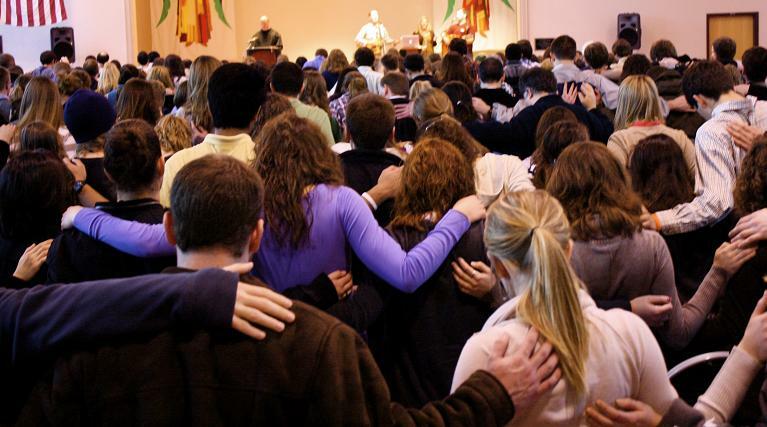 lead about 300 young adults on a spiritual journey. We learned to open up to the Holy Spirit, get to know Him in prayer, and experience Him in everyday life. We learned about how prayer and trusting God are essential to our relationship with Him, but in order to move deeper in the spiritual life and unleash power in prayer we must confront sin honestly and come to God - since only He can set us free. We need to approach God's mercy not just as a cleansing routine, but to experience Jesus who died for us and rose from the dead because He is waiting for us to let Him transform us from the inside out. Local musicians lead beautiful and heartfelt songs of praise and worship, and we enjoyed fellowship with old and new friends. 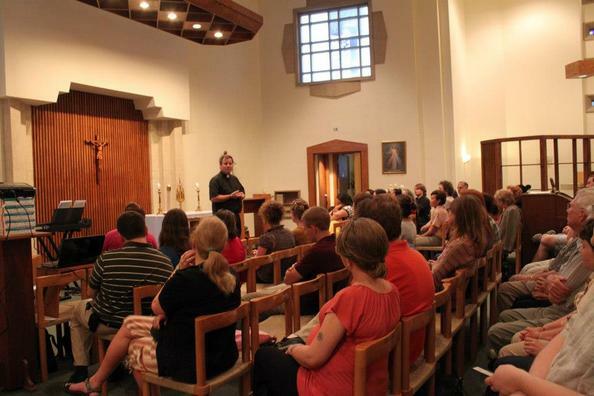 Listen to the talks: Baptism in the Holy Spirit, and the talk on Suffering. "Dear young people, let me now ask you a question. What will you leave to the next generation? Are you building your lives on firm foundations, building something that will endure? Are you living your lives in a way that opens up space for the Spirit in the midst of a world that wants to forget God, or even rejects him in the name of a falsely-conceived freedom? How are you using the gifts you have been given, the “power” which the Holy Spirit is even now prepared to release within you? What legacy will you leave to young people yet to come? What difference will you make? The power of the Holy Spirit does not only enlighten and console us. It also points us to the future, to the coming of God’s Kingdom. What a magnificent vision of a humanity redeemed and renewed we see in the new age promised by today’s Gospel! Saint Luke tells us that Jesus Christ is the fulfillment of all God’s promises, the Messiah who fully possesses the Holy Spirit in order to bestow that gift upon all mankind. The outpouring of Christ’s Spirit upon humanity is a pledge of hope and deliverance from everything that impoverishes us. It gives the blind new sight; it sets the downtrodden free, and it creates unity in and through diversity (Luke 4:18-19; Isaiah 61:1-2). This power can create a new world: it can “renew the face of the earth” (Psalm 104:30)!"